Hundredth gram resolution and four different weighing modes. 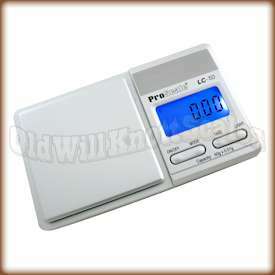 Easy CalibrationThis scale comes factory calibrated and ready to use. Just in case ya need to calibrate it, the LC50 comes with easy to follow calibration instructions. You'll just need to pick up a 50 gram calibration weight to get the job done. The Protective Cover Does Double Duty!This tiny scale's hard protective cover is great for keeping your scale safe when ya aren't using it...and it doubles as a nice expansion tray, increasing the area ya have to weigh your stuff on. Man, This Thing Is Small!You won't have to worry about this digi scale taking up space. It's just under five inches long, and just 0.6" inch thick! You can take this mini scale pretty much anywhere ya want...stick it in a pack, purse, or in your shirt pocket. It Remembers The Last Unit Ya UsedIf your application needs weights in the same unit of measurement, (like ounces for instance), it can be a real pain if your scale always turns on ready to weigh in grams. It's a good thing the ProScale LC 50 turns on displaying the unit of measurement you were using when ya turned it off. Auto-Off FeatureIf ya have ever had the batteries in something run out because you forgot to turn it off, you'll realize what a blessing this feature is. The LC50 will automatically turn off after a few moments of inactivity, saving battery power and money. Works well. It is consistent every time I put the cover on the scale it reads the same. Easy to use and it appears to measure to .01 g as advertised. Very reasonable price. Quick delivery. Thank you for a good product. This was a replacement of the first scale I received. I appreciate the great service; didn't even have to return the defective product, but the replacement didn't work either. Great little scale, but you need some pennies! I’m very happy with this scale. It had a little learning curve -- figuring out what "CAL" meant on the display. Turns out (go figure!) I had to calibrate the scale with 50g of weight. ARGH! Fortunately, some googling told me that US pennies since 1983 are 2.5g each, so 20 pennies = 50g! Calibration, DONE. FYI, you can also use 10 US nickels -- but IMHO, more pennies means that any individual variation in weight (dirt, corrosion) will hopefully be averaged out. I love this convenient and accurate little scale from Old Will Knotts. I use it for my felting projects and it's perfect for my needs. It arrived quickly and works exactly as I had hoped. 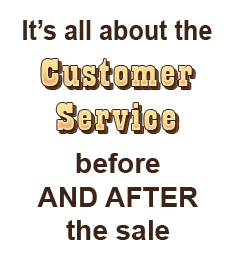 Good service and good price. Thank you! It serves its purpose. It was inexpensive. Very simple to use. I like it very much. The only thing is that the battery door is plastic and has a little plastic piece that holds it in place against the force of spiral and I have a feeling one day it is going to break. Top notch, hasn't failed me yet, a real steal of a deal. I received my item in perfect condition and calibrated to within .01 I ordered a 1 gram weight along with this scale to ensure its accuracy. To say the least I was very impressed by the scale and old willknotts customer service and how they checked up on me every step of the way to make sure I received exactly what I purchased in complete working order. 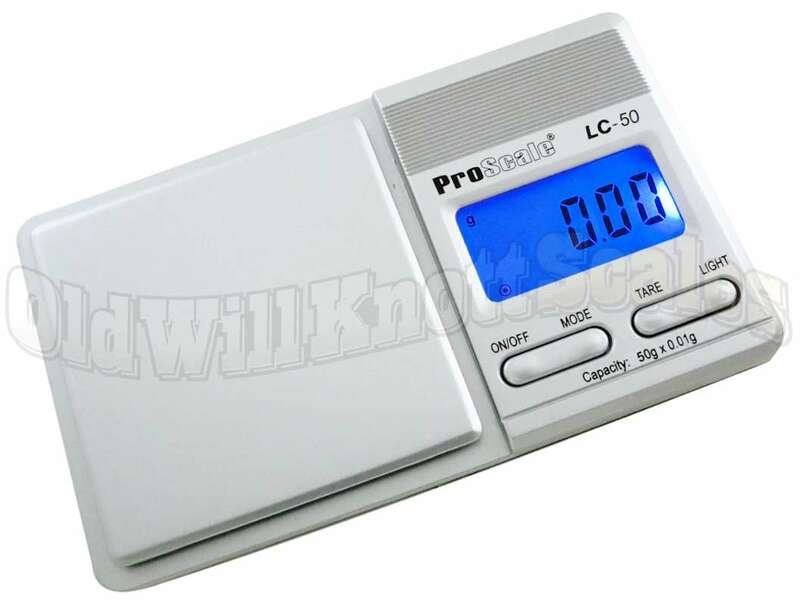 Do not worry when dealing with old willknot only place I'll ever buy a scale from again. Fantastic little scale. No doubt it is accurate. I weighed items like coins that have a know weight and this scale is spot on. Buy this scale. the scale is perfect. Simple to calibrate and easy to use. Cant beat it m for the price. Great scale good visibility nice!! This is actually the 2nd of these scales that I have owned. The first one was so wonderful and dependable that I bought this one as a gift for a friend! I have never had a problem with this scale, and I have never even had to calibrate it! It reads spot on. This scale feels a little cheap and is made entirely of plastic so don't be deceived by the metal appearance in the photos. Aside from that, it is very light weight, affordable, and does its job so I can't really complain much. Nice little scale. Very happy with the purchase. Highly accurate and repeatable scale. The price is also very reasonable.